Well, as I am rinsing my hair in the shower last night, I see the largest brown house spider IN THE WORLD on the far edge of the tub surround. I freeked out a little, but calmly turned off the water and opened the shower curtain to get tissue to get rid of the spider. I didn’t get a good grasp on him at first, but I smashed it back on to the wall to kill it. Something happened while smashing the spider, and I fell out of the shower. I lost my footing and landed face first onto the toilet then onto the floor. Blood started dripping from my nose and having to pick myself up off the floor was difficult. Pepper was amazing! He helped me get the bleeding to stop somewhat and get dressed. Pepper drove me to the emergency room in Eupora. Luckily, I only have a broken nose! I am pretty convinced that my shoulder is messed up this morning, but that is another x-ray for later today! It is kinda funny, after two years of cancer business and a blood clot, I have not had to go to the emergency room. But I was there last night because of a spider! But let me tell you, #GODISGOOD and we have been #incrediblyblessed! Our bathroom is so small, things could have gone a lot worse! 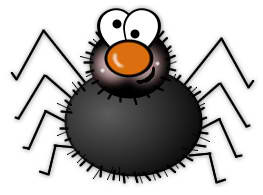 Everything hurts, but I’m alive to feel how sore everything is this morning, and I am happy to say, the spider is not!!!! On the way to the toilet, I did manage to kill the spider and have him land where he was flushed to a watery grave. At least something good has come out of all this! Now, I am headed back to the doctor for more x-rays! I am pretty convinced this morning that something happened to my shoulder in the midst of all this! #GODISGOOD! You are the most positive person I know. Hope you are ok. Not surprised if your shoulder isn’t hurt. Years ago my dog ran in front of me as I was racing to the door. I fell face first on the tile floor (concrete underneath). Broke my nose, shoulder, sprained the wrist on my other arm. Drove myself to the ER (in shock and bleeding so much). Upon arrival I got a stern lecture on driving with a head injury. Luckily breaks were not bad, but sure hurt. Thank you so much! #GODISGOOD and the shoulder does hurt. No broken bones but they are talking torn rotator cuff???? “Don’t say! Don’t say!” MRI next Tuesday.